Beijing : China has financed and constructed Sri Lanka's first new railway line after the island nation became independent in 1948. 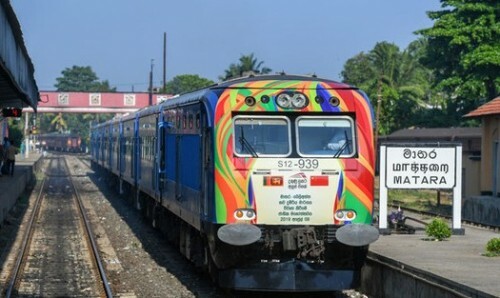 The 26.75-km long Matara-Beliatta railway extension was declared open for the public by Sri Lanka's Transport and Civil Aviation Minister Arjuna Ranatunga on Monday. China has invested heavily and pledged financial loans to Sri Lanka, a strategically located country in the Indian Ocean. Beijing already has a 99-year lease of Sri Lanka's Hambantota port, a result of Colombo's failure to repay Chinese debts. The railway extension was financed by the Export-Import Bank of China (China Exim Bank) and the contract was awarded to China National Machinery Import and Export Corporation, Chinese state news agency Xinhua said in a report. The Matara-Beliatta railway line is the first to be constructed in Sri Lanka since 1948 and it includes the longest and second longest railway bridges of 1.5 km and 1.04 km, respectively, the state media said. Chinese Foreign Ministry spokesperson Lu Kang confirmed Chinese funding of the project. "Yes, the phase-one extension line of the southern railway in Sri Lanka is the first railway project contracted by a Chinese company in Sri Lanka under the Belt and Road Initiative (BRI) and it is indeed the first railway built after the country's independence," the spokesperson said. "It is now officially opened and it will make regional transportation more convenient and facilitate local economic and social development. The Sri Lankan people are pleased to see that and China is pleased for the Sri Lankan people," Lu said. "China will like to expand and deepen our practical cooperation under the BRI and deliver benefits to the people with concrete outcomes," Lu added. China is Sri Lanka's biggest lender. Sri Lanks's envoy to China in February said Colombo will get a $1 billion loan from China and might sign a free trade agreement with Beijing. Sri Lanka is returning to normalcy after being hit by a deep political crisis last year that plunged the credit rating of the already-indebted country. The Chinese have made deep inroads into the strategically located nation in the Indian Ocean and have a 99-year lease of the Hambantota Port after Sri Lanka failed to pay back loans. Beijing's growing presence in Sri Lanka worries India which held considerable clout in the country.